TicTacCoupon is a suspicious browser extension which can be installed onto the most popular web browsers in the most illegal manner. While many unreliable advertisement-supported programs can enter the system using misleading information and tricks, this threat simply enters without permission. Despite this, it is most likely that the program will come bundled with other installers. Our recommendation to you is to be careful when installing software onto the computer at all times. If you do not follow this advice, it is likely that you will need to delete some sort of computer threats sooner or later. Right now, however, it is TicTacCoupon removal that you should be most cautious about. 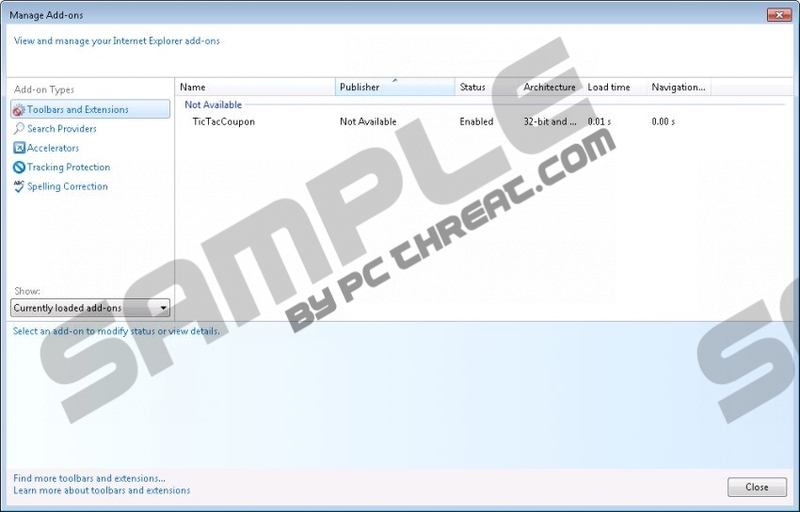 It is not a surprise that TicTacCoupon does not have an official download page; however, just like other applications distributed with the help of InstalleRex-WebPick installers, it can use other sources. SAveLots, SaveNewAppz, AllTubeNoAds, and other similar advertisement-supported software can hide behind links of the domain veteransunbestlove.info. Other clandestine tricks could be used as well. However, what is most tricky about the infection is its name. According to malware researchers, it may be difficult to delete TicTacCoupon from the system because certain automatic malware removers may fail to locate it due to changed names. Name randomization is a trick used to postpone the removal of the unreliable program. Difficult TicTacCoupon removal is an obstacle; however, the biggest threat is the features of this advert-supported program. As you probably have noticed already, this application presents online advertisements when browsing the web, and this is why it is categorized as adware. In order to learn more about you and display more alluring offers, TicTacCoupon uses tracking cookies to spy on you. Note that you can delete these cookies; however, we recommend having the entire program removed instead. If you do, the illegal connection to the Internet which can be created by the application will be disabled as well. Download a malware scanner to learn what threats you need to remove and where to find adware if you are thinking about manual TicTacCoupon removal. Keep in mind that this is not a simple task and you may need to perform quite a few steps. Of course, we recommend that you begin with the removal instructions below. If you are not sure how to delete TicTacCoupon completely, you can leave this task to the automatic malware removal software. This is a great option regardless of whether you are experienced with malware removal or not. Right-click on the Metro UI menu and select All apps to open a new Apps menu. Go to the Control Panel and in the menu select Uninstall a program. Now right-click the application you have chosen to delete and select Uninstall. Navigate to the left of the Task Bar and click the Windows (Start) icon. In the user menu select Control Panel and click Uninstall a program. In the Change or Remove Programs menu select and Remove the undesirable program. Quick & tested solution for TicTacCoupon removal.